The Market Malaysia Leadership School 2019 Tickets can purchased on your UnFranchise Business Account. The annual event is a great opportunity for you and your organizational partners to learn and grow! Numbers are limited so act now! Tickets are available for pick-up at the MAMY Showroom until 24 October, 2019. Showroom Operating Hours are Monday-Friday from 11:00 a.m. - 7:00 p.m. and on Saturday from 10:00 a.m. - 2:00 p.m. Address to the Showroom: B03-A-07-1, Menara 3A, No. 3, Jalan Bangsar, KL Eco City, 59200 Kuala Lumpur. 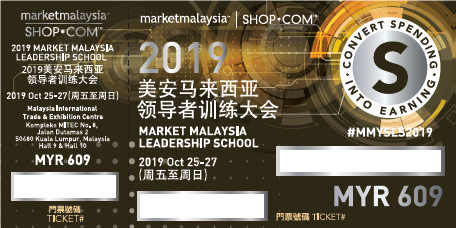 2019 Market Malaysia Leadership School Tickets are non-refundable. *This schedule is an example only. Schedules may vary. Speakers, Agenda, Dates and Locations are all Subject to Change. Please note that ticket purchases are nonrefundable. Welcome to Market America Events! Find all the information you need for any Market America event here. MarketAmericaEvents.com gives you instant access to our regional conventions along with seminars, trade shows and conventions. You can also find out how to register for your next Market America sponsored event along with all the details to make your experience the best possible.